It was really nice to not have a set schedule when you’re on vacation. For our Korean trip, Fannypack and I have an understanding that it’ll be relaxed, not having to rush to sight-see and make time. Some may think it’s a waste of a plane ticket, but we didn’t feel that way at all. We only lament that we didn’t get to eat everything we wanted to try. 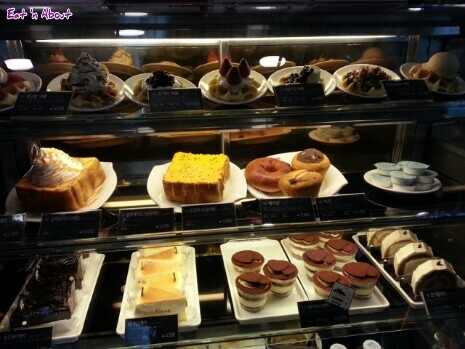 There were quite a few famous coffee shops that are really close to our hotel. We decided to visit one of them for breakfast the next day. 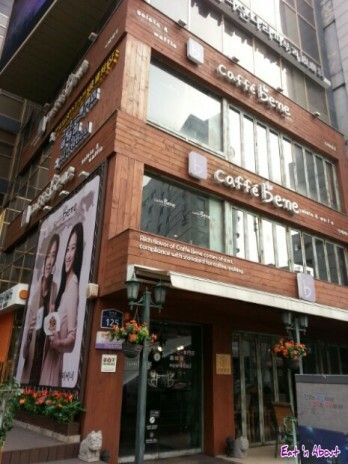 Korean drama fans should recognize this one- Caffe bene. I myself am not such a fan. Therefore I had no idea what this is. 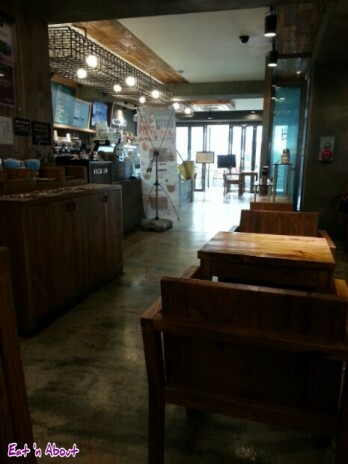 However, seeing that big poster on the side with who I can only assume to be a super famous Korean teen actor (he was on EVERYTHING….makeup shop posters, normal posters….he has great skin…and looks like a girl…), it should be safe to say this was one such coffee shop that had been on a drama. 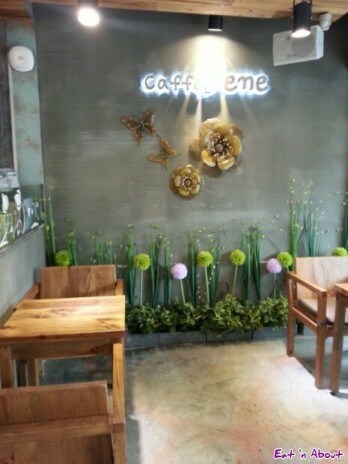 I must say, the interior of Caffe bene is very, very nice. There’s a lot of 3D metalworks of flowers and just a very nice ambiance all around…too bad it’s so cold. At the “fridge” they had a display of realistic but fake models of their food offerings. We were at first super excited. However, we were quickly informed upon ordering, that certain items we wanted were “sold out”. Now you must know, it was around 10am…so of course we were a bit miffed….after all what we wanted was a Blueberry yogurt waffle…how hard was it to provide that?? And again, it was so early in the morning…did the morning “rush” deplete their stock?? Anyways I digress…we ended up getting two items to share. 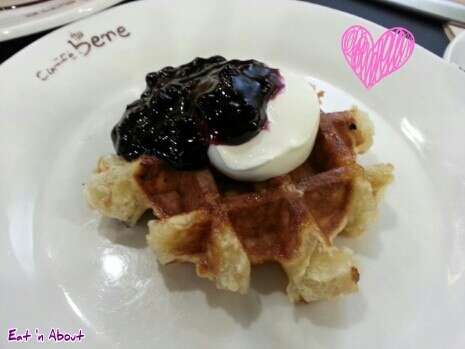 Instead of the “sold out” Blueberry yogurt waffle, we got the Blueberry cream cheese waffle. It was the size of your usual Liege-style waffle, albeit not as sweet as the North Americans make it. With a cute little dollop of cream cheese, and a thick blueberry coulis. It was nice and warm and very yummy. 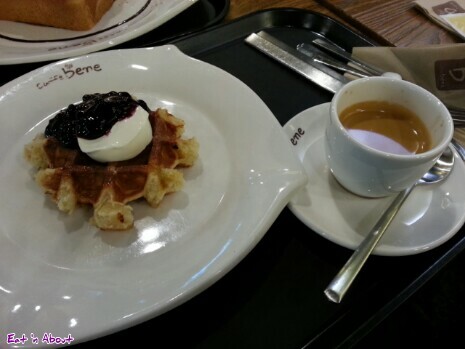 The waffle was crisp with a soft and chewy centre. 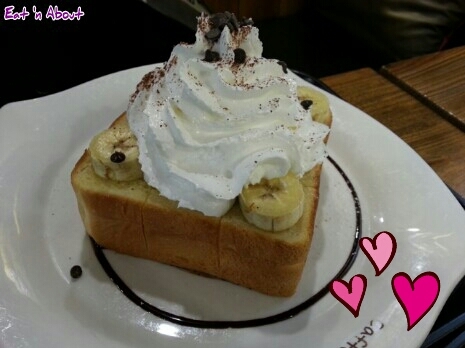 Our other selection was the Chocolate Banana Honey Toast. Now I know that honey toast box concoctions are all the rage in Taiwan, but I’ve never had one, so I was pretty excited to try it. It was about 2 inches thick and cut into 9 cubes, smeared and toasted with honey, sprinkled with sliced almonds. However there was only 4 slices of banana and sprinkled with a rather stingy amount of mini chocolate chips. What they weren’t stingy with though, was the whipped cream. Look at that mountain!!! It was however not super sweet which was also a nice change. What I would change with this though, was instead of using chocolate chips, maybe a few squirts of chocolate syrup would make this more “Chocolate” tasting. Nonetheless this was still very satisfying and yummy. Loved the fact that the bread was so soft and cake-like.